It’s also time to say hello again to the overwhelming positive energy that has defined earlier Los Campesinos! albums. “Life Is a Long Time” — with chorus, “It starts pretty rough / And ends up even worse / And what goes on in between / I try to keep it out of my thoughts” — features rapid, giddy hand-clapping. The whole crew sounds downright exuberant as Gareth admits, “Although I always made her purr like a cat / She said I never made her smile like that” on “Songs About Your Girlfriend.” Even the morosely-titled “Baby I Got the Death Rattle” is relatively sunny. 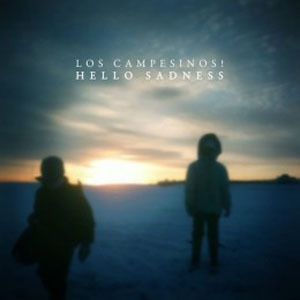 But Hello Sadness doesn’t feel derivative of prior releases, largely because the Campesinos! allow themselves to wallow in their sadness just a little more than they have before. The whole album isn’t about juxtaposing peppy music with depressing verses; the group actually slows down on three entire tracks: “Hate For the Island,” “To Tundra,” and “Light Leaves, Dark Sees Pt 2.” It’s a side of the band that has only been hinted at before — most notably with “The Sea is a Good Place to Think of the Future,” a stand-out track from its last album, Romance is Boring — and it’s a satisfying shift. Los Campesinos! fans have to be some of the most impatient out there. After all, the group released its first three albums in a span of less than two years. In comparison, the 22-month wait for Hello Sadness seems like a veritable lifetime. But with the familiar bounce and sardonic lyrics — and the development of the band’s capabilities to produce tamer, deeper, more mellow fare — it’s been worth the wait.